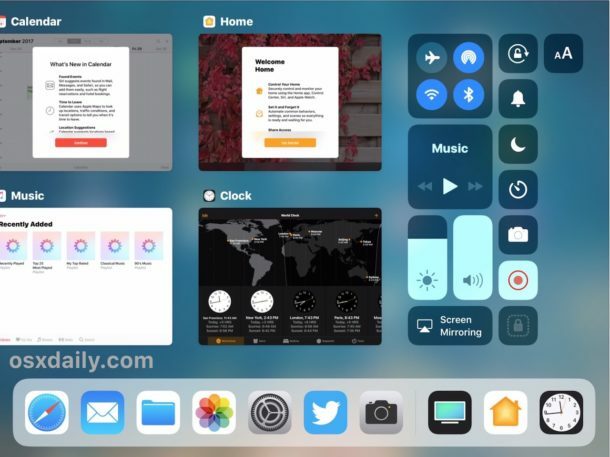 iOS 12 and iOS 11 on iPad features an excellent new app switcher, complete with an all new look and a multitude of nice multitasking features, as well as the ability to perform critical functions like force quitting apps. 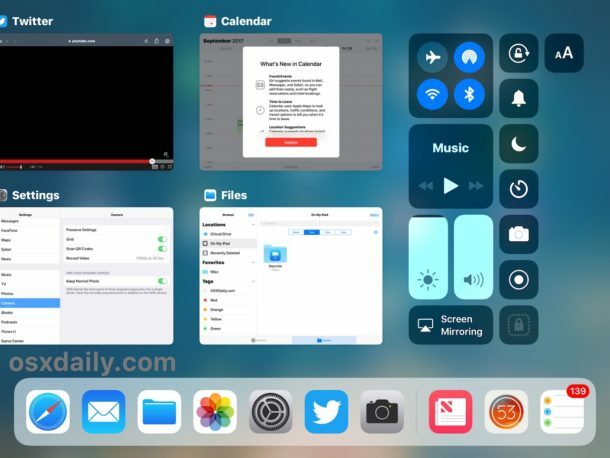 We’ll show you how to force quit out of an app on the newly redesigned app switcher for iPad that comes with iOS 12 and iOS 11. 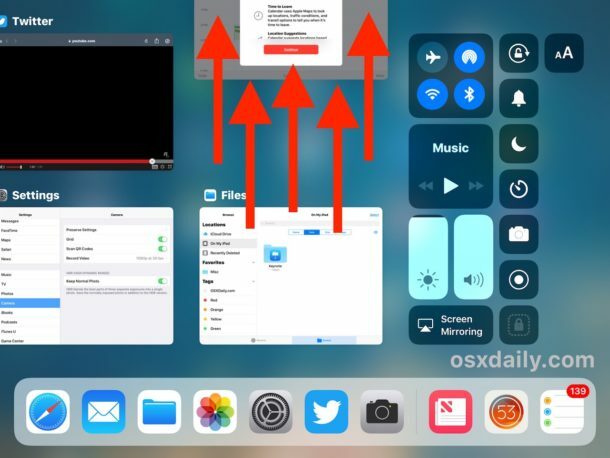 Obviously you’ll need to have updated to iOS 11 (or later) to have the new app switcher and properly follow this guide. It’s worth mentioning that forcibly quitting apps on iPad with iOS 11 follows the same general mechanics as prior versions of iOS when closing out of apps, but the interface has been redesigned, and there are now more than one way to access the app switcher too. The brief video below demonstrates an iPad running iOS 11 and forcibly quitting apps. As you can see the app switcher is accessed, and then apps are quit by the swipe up gesture. If you’re force quitting an app on iPad for troubleshooting purposes, typically relaunching the app is the next step. If a particular app is repeatedly needing to be force quit due to experiencing difficulties, it’s also a good idea to try and update the app via the App Store. You can also forcibly quit multiple apps at the same time from the app switcher in iOS 12 or 11. 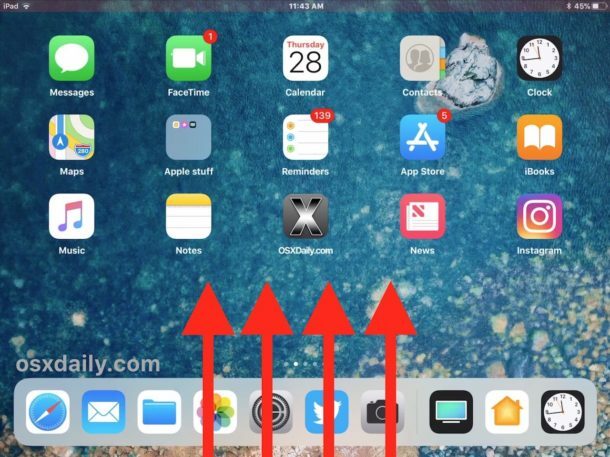 To force quit multiple apps at the same time, access the App Switcher as usual (double-tap the Home button or swipe up from the bottom of the screen via the Dock), and then tap and hold on multiple app preview panels. Then while tapping on multiple apps with multitouch, swipe up on them all together, pushing each off the top of the screen. You can force quit multiple apps this way rapidly if need be by continuously swiping up on every app visible on the app switcher. Can you please include any information directing people that force quitting applications should be rare. Force quitting an application while it is writing to a database file or communicating with a server will kill the application while doing so. This will result in data loss or corrruption. Force quitting apps is super bad, like pulling the plug on your computer while it is doing something. This has been blogged about over and over and people still force quit applications. It does not save battery, but rather takes more battery on average because the program has to be reloaded in memory and most likely has to re-establish network connections over cellular which will waste more battery. Most resident programs in memory do not background anything and consume 0 battery. Please encourage people to let iOS close applications like it has been designed to do:by itself seemlessly so you don’t have to. This. Precisely. All the way. You rock! What is described in the article isn’t actually force quitting. The article is talking about normal quitting procedure, like doing command-q on a Mac. The application has time to save all of its files and quit properly. There is a way to actually force-quit an app in iOS, but i won’t go into that.